Authorities unveiled a new mobile incinerator that will be used to destroy unwanted or expired prescription pills in the future. 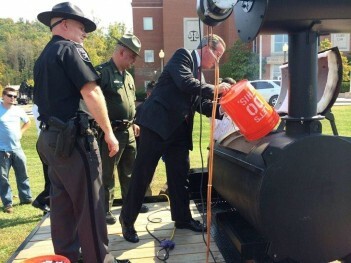 State Police Lt. Michael Baylous, Putnam Sheriff Steve Deweese and U.S. Attorney Booth Goodwin hoisted large orange buckets filled to the brim with a mixed assortment of pills and dumped them, one by one, into the smoking maw of the black incinerator Tuesday afternoon at the Putnam County Courthouse in Winfield. The pills were from the 2.5 tons collected Saturday as part of the National Prescription Drug Take Back Day. Saturday’s event was the last event sponsored by the Drug Enforcement Administration, Goodwin said. The federal agency has conducted take-back days since 2010 because there weren’t any rules on properly disposing of unwanted or expired medications. The DEA began working toward safe disposal rules after the first take-back day. The final rule was issued this year, allowing DEA-registered hospitals, pharmacies, long-term care facilities and others dealing in pharmaceuticals to modify their registrations to become authorized collection sites, according to the DEA’s website. Law enforcement agencies also may continue collecting pills. Goodwin said when the events began there were no standalone drop boxes for medications. Now, both Kanawha and Putnam sheriff’s offices operate collection sites in Charleston and Winfield. The Putnam Sheriff’s Office collected some 221 pounds of medications in the last event.